We introduced some of the more significant rules changes found in the newly released L2 Design Group Deluxe Edition of the game, to include the Peiper Alternative Variant which allows the German Player to break down the larger KG Peiper unit into its smaller components. This allowed the German player more breakout flexibility, but was offset by other rules benefiting the Allied player, such as retaining full defense strength when out of supply and not beginning the surrender die rolls until the 17AM game-turn. Last year's champ, Tom Gregorio, was only able to commit to the Mulligan Round on Tuesday evening, but did an admirable job of retaining his number one AREA ranking by defeating Steve Likevitch, who played the Allied side. In the first round of play, the game's designer, Randy Heller, took advantage of the new Clervaux fortification rule to place the Middleton HQ and a full strength infantry unit in the town. His German opponent, Forrest Pafenberg, mustered a 5-1 attack vs Clervaux but still only had a 50/50 chance of routing the defenders and taking the surrounded fortification on the first attempt. Had the attack failed, the Germans would be behind their timetable. The nail biting die roll came up in the German's favor. Forrest went on to win this game by capturing Eupen and Noville and destroying 12 enemy units. In the semi-final, Nick Frydas met Phil Evans. Phil unhinged the American defense by capturing Monschau on the opening turn with a 1-1 attack. Nick was sent reeling with continued above average German die rolls. After Phil blew open a hole with mechanized units and followed-up with exploitation along the Beho-Houffalize road net, Nick threw in the towel. The final round saw two titans square off. Bob Ryan played the Germans vs Phil Evans' Allies. Both were previous winners of the wood (Bob winning a BPA email BWD tournament). The opening guns saw no Ami losses or engagements in the far south. The bridges in front of Clervaux and at Vianden were successfully built. A Counterattack was rolled against the 14th Armored Cavalry Group in the Losheim Gap. This allowed a key regiment of the 106th ID to retreat to Schonberg. Rocherath-Krinkelt was captured on the opening turn. Phil responded by placing both the 106/422 and 14th ACG in Schonberg. Further Allied units defended in and before Clervaux. On 16PM, Bob chose to attempt to surround Schonberg by attacking defenders on the flanks of the village. A D2 vs 28/110 placed the German forces adjacent to Clervaux and a D2 vs Bullingen combined with a KG Peiper reserve move cut the road leading to Malmedy hampering US movement of 2nd ID. The American player abandoned Clervaux and defended along the road to Bastogne. Allied Air Interdiction was placed in the St. Vith environs to limit German movement options. A triangular defense was used, centered on Malmedy, to limit the Peiper breakout potential. On the German 17AM turn, Bob executed a masterful Angriff Attack along the Beho/Houffalize Road, effectively trapping two U.S. units. KG Peiper attacked U.S. infantry in front of Stavelot. No Allied artillery support was available for this particular defense. A D3 resulted in Peiper advancing across the bridge into Stavelot and threatening Trois Ponts. Skorzeny executed a reserve movement placing the roads out of Malmedy in German zones of control. At this point the Allied player was in dire straits. Only one unit was able to reach the center of the map to defend Parker's Crossroads. Part of U.S. 7th Armor had to be held back to block KG Peiper from driving on Liege. Phil heavily defended Malmedy and Eupen to prevent further German gains. On the German 17PM turn, a D4 against the defending unit in Vielsalm captured the bridge and placed 116th Panzer in Parker's Crossroads. German mechanized units successfully attacked Noville. A trapped unit on the road to Bastogne was eliminated. KG Peiper broke down into its three component units and attacked the lone artillery unit defending Stoumont. 12th SS attacked north of Malmedy and trapped two U.S. units in Malmedy in a generous advance after combat. With the situation going from bad to worse, the game was concluded. Congratulations to Bob Ryan for his first WBC Bitter Woods Tournament win. Most observers felt Phil was unstoppable based on his early round performance. Phil attributed this loss to early misplacement of his defense in and around Schonberg, and plans on revenge next summer. 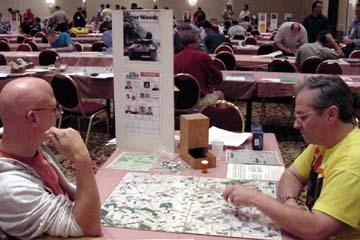 Next year's WBC tournament will fully transition to the new L2 Design Group version of Bitter Woods, with all the accompanying rules changes. We anticipate once again playing the 6-turn scenario with probable use of time clocks. For those new to the game, the Tuesday evening Mulligan Round will ensure at least two games played.